Video Gumbo also features Ferguson's rendition of "Vivaldi Violin Concerto G minor RV578" as the second video of the show. This the 7th album release, 13 years after the first CD "Strad To Strat" by guitarist, Kevin Ferguson, which has been the number one top seller in 2 categories (classical and neo-classical metal) at Guitar Nine Records. (See below for track details, audio samples (now includes MP3), digitial downloads, ordering & download information, reviews, performance dates, latest CD releases (Click here for the newest CD), how to get on the mailing list and sheet music transcriptions). 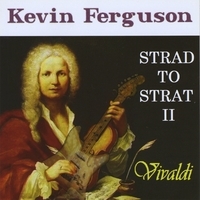 STRAD TO STRAT II Vivaldi includes the above works, arranged for electric guitars, string orchestra and misc. keyboard (harpsichord, organ, etc.). Concerti were mostly selected from either Vivaldi's "Harmonic Inspiration" or "La Stravaganza" violin concerti for solo or multiple violins.